Beautifully renovated stone house at thriving B & B with excellent reviews. Approached via a gated entrance and manicured garden area. Large hallway, huge kitchen dining room with additional utility / back kitchen. Dual aspect lounge and private office / study. Decorated and presented to an exceptionally high standard throughout. Six wide themed bedrooms, several with en suite facilities. Impressive family bathroom with feature bath set on an illuminated plinth. The house retains its original classic looks both inside and out with traditional wooden staircases and landings including a comfortable seated library area.Below stairs there is a cellar (approx. 90m2) which currently houses the Central Heating Boiler • This area could be further developed and is currently a blank canvas. Across the courtyard is a pretty stone building / barn currently used in a workshop / storage that would convert to a 2 bedroomed cottage. Overall, including the above barn and cellar, the property offers approximately 400 m2 of usable space. An outstandingly attractive property offered at an attractive price. 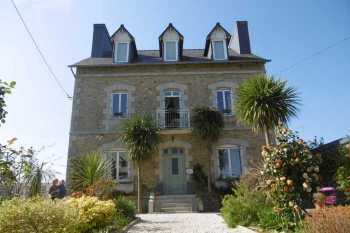 Situated in the market town of Callac in Central Brittany.The town offers: schools, weekly marketers, supermarkets, merchant builders, garden center, a selection of small shops, doctors, dentists, traditional sports and fishing suppliers, several bars and a good choice of restaurants making this an interesting place to live. Wood floors Dining room Kitchen area. Concrete Stone Building / garage workshop - potential to convert to further accommodation. Wood floors Library / seating area.